I have recommended Zerodha since 2013 and one of the main reasons for recommending them was they offered very innovative solutions like Z5 HTML5 platform, Charts, Good Backoffice Software. It seemed like was a broking house that was designed by the traders for the traders. But recent incidence I encountered that was really hard to digest and created doubt about Zerodha as a company. So let me share with you recent trust issues that I experienced with them as well as some of my blog readers who have confirmed which has made me to stop recommending them. 1. Affiliates as Employee – Is it? I recommended Zerodha to my readers and they paid me part of whatever brokerage they made from my referred customers at no extra cost to them. I hardly made ₹500 per month because my recommendation wasn’t for the commission but was more of a genuine recommendation. They had been paying me since 2014 but a few months ago they switched the payment type to sub broker payment which was quite ok to me because they used to pay me part of whatever they would earn as brokerage from customers referred to them by me. The TDS for payment were deducted correctly as well as was getting credited with nature of payment as 194H which meant brokerage and commissions payment. 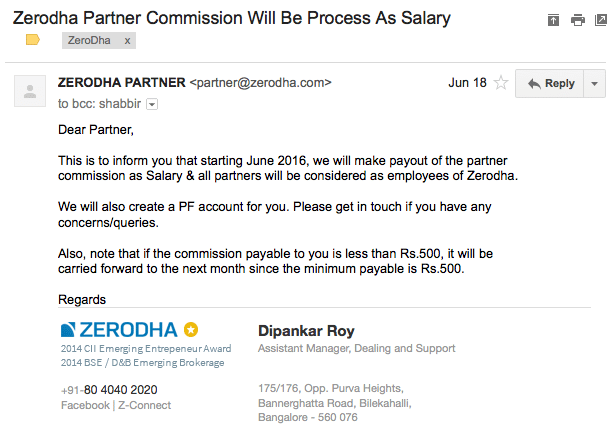 All good till June 18 when I got an email where they switched the payout of the partners commission as salary & all partners will be considered as employees of Zerodha. I am not sure exactly why this is done and there is no reason given either. What I sense is it could be related to SEBI’s rules for unregistered sub broker’s (remember they treat affiliates as sub brokers) but there can be various other reasons like they want to show higher number of employee count or want to show low attrition rates of employees or it could be related service tax which is not applicable on salary or any other reason. Whatever be the reason, it creates a doubt in my mind as to why. 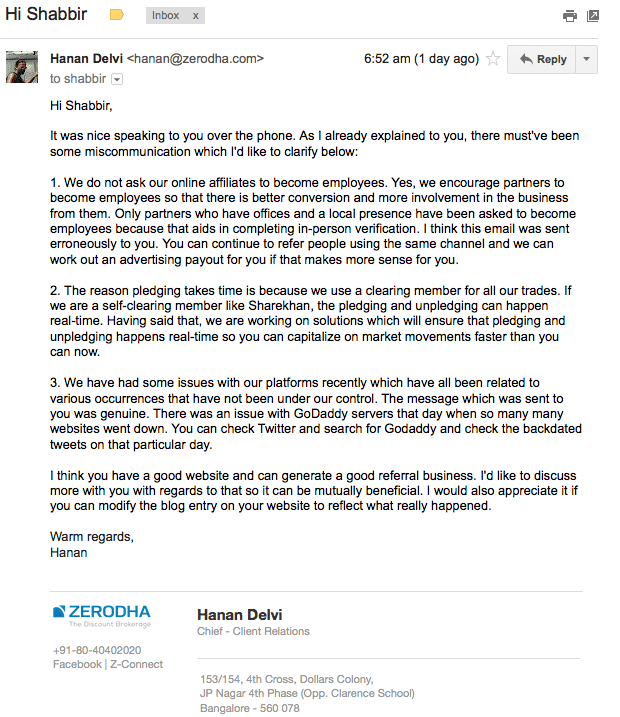 Clarifications By Zerodha: My Verdict – Not convinced & Looks Scammy? As per Ministry of Corporate Affairs site, Hanan Delvi is one of the directors of Zerodha Securities Private Limited. So why I am not convinced on being an employee? First they say that email was sent in error by the associated partner or AP team. Do you believe that. The erroneous email was sent on June 18th and you have not emailed back again saying please discard the message sent and you don’t need to be an employee. It could be that you didn’t realize but now you know it was error, so why there isn’t any mail in last 48 hours and why only a personal email sent only to me. Looks like it was an error only to me. The more important question is – Why they wanted partners to be an employee? In the long discussions we had over phone about why they wanted to make partners as employees and as expected it was inline with the regulators but was also inline with showing employees PAN India. If you are opening a trading and Demat account, Zerodha’s employee should verify the documents. Zerodha’s don’t have employee’s in many parts of India so they want associated partners as employees. Show referred customer as verified by the referred AP who is now an employee. Show referred customer as verified by an AP who is now an employee in that region. In either case you are allowing unverified accounts to be shown as verified to the regulators and doing it in the name of the employed AP. One more possibility could be to ask employed AP to verify the documents as well as assign the referred customer to him instead of the one who has actually referred which may not be right on the AP’s. In all possible alternatives, asking partners to be an employee is looks phishy to me and so my initial verdict of company cutting corners looks more true now. Moving shares from DP (Depository Participant) to margin known as pledging of shares may be needed if you want to place a buy order before you have money in your trading account. It could be for various reasons including a technical glitch where money is debited from your bank account but not credited instantly in the trading account. So instead of waiting for money to get credited, you can execute a purchase order using stocks in the DP account to be moved over to margin as credit to place buy orders. One of my blog readers reported that Zerodha has margin where if you put pledge stocks to margins, it takes 2 days for the shares from margin to come back to DP and then only you can sell. In ShareKhan, I can pledge and un-pledge shares instantly and can even place immediate sell orders on shares that were pledged for few days and unpledged. This made me to think if they actually keep the stock in the DP when we move them to margin or they sell it off in the market and purchase back when we move them back from margin to DP. Don’t see any other reason for delaying in availability of shares. If they sell off shares in margin, it can mean you lose dividends or can have short term capital gain tax on the transaction due to the sale and purchase of shares but as per their website, it states we will continue to get benefits of all corporate actions like dividends, splits, bonuses, etc. on the stocks pledged. Zerodha is low brokerage broker and so they use IL&FS for some services which makes them bottleneck to pledging of shares. The process is if you pledge, the shares goes to IL&FS and they release the margin for trading. Again once the request is placed for unpledging, it takes time for IL&FS to release the shares from margin. 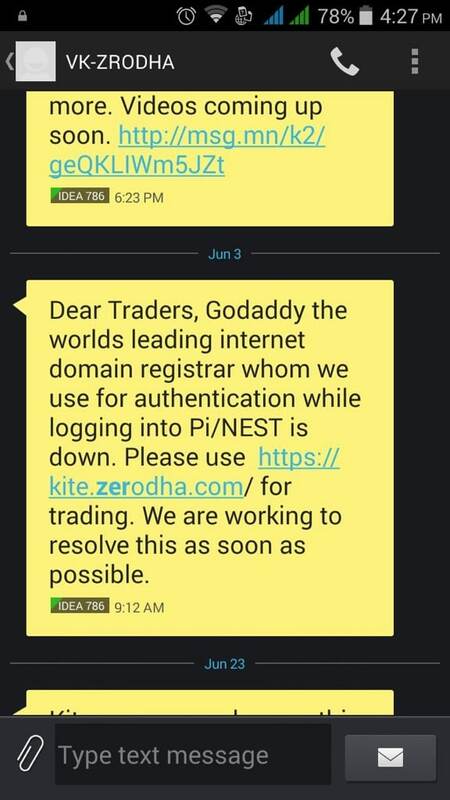 Have experienced when the complete Zerodha system was not reachable for a few hours and the SMS wording made it look like the issue was with GoDaddy domain registrar whereas actually it may have been an issue of the hosting server that Zerodha uses from GoDaddy. Apart from that I see a lot of issues to system being down or not available too often. 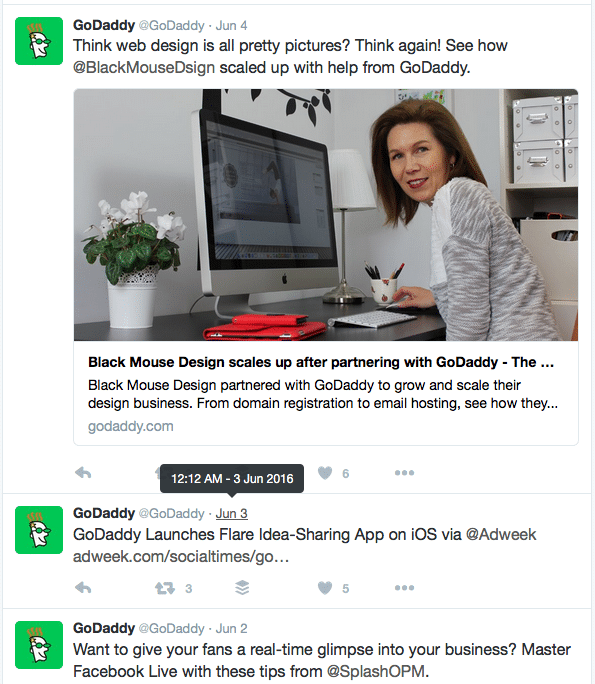 I did expect a link to the tweet in an email but GoDaddy had only 1 tweet on 3rd June. Here is what I see tweets in the official GoDaddy Account. I will not prefer my money or my investments lying with a company that is trying to cut corners. So I have stopped recommending them as well as I thought it would be fair to my readers to let them know that I don’t recommend Zerodha anymore. 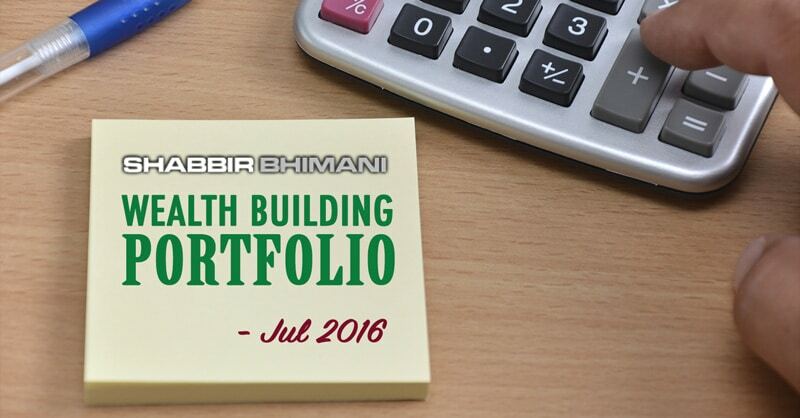 As of now, I will recommend ShareKhan despite high brokerage. I may experiment with other low brokerage brokers and see if I can come with an alternative to Zerodha.